Basic Income: And How We Can Make It Happen (London: Penguin, 2017). The Corruption of Capitalism: Why Rentiers Thrive and Work Does Not Pay (London: Biteback, hardback 2016; paperback 2017). Basic Income: A Transformative Policy for India (with S. Davala, R. Jhabvala and S.Kapoor Mehta (London and New Delhi: Bloomsbury Academic, 2015). 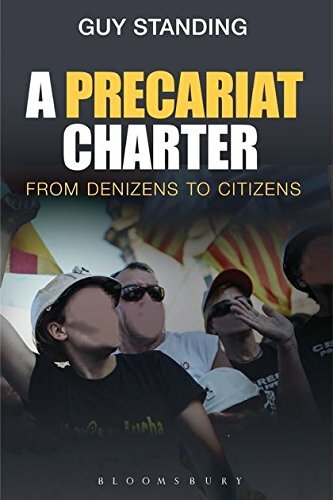 A Precariat Charter: From Denizens to Citizens (London and New York: Bloomsbury Academic, 2014). The Precariat: The New Dangerous Class (London and New York: Bloomsbury Academic, 2011; Second edition 2014; Third edition [Revelations series] 2016). A full list of books can be found here. A full list of reports can be found here. A full list of working papers can be found here. “Rentier capitalism and the precariat: The case for a commons fund”, in J. McDonnell (ed. ), Economics for the Many (London and New York: Verso, 2018), pp.195-206. "Taskers in the precariat: Confronting an emerging dystopia", in E. Paus (ed. ), Confronting Dystopia: The New Technological Revolution and the Future of Work (Ithaca, NY, and London: ILR Press, 2018), pp.115-133. "Precariato" in G. Battiston and G. Marcon (eds), La sinistra che verrà: le parole chiave per cambiare [The left that will come: The key words for change] (Rome: Edizioni minimum fax, 2018), pp. 181-189. "Renda básica incondicional: dois projetos-piloto em Madhya Pradesh [Unconditional basic income: two pilot projects in Madhya Pradesh]", in A. Rocha, D. Calderoni, M. Comes Justo (eds), Construções da felicidade [Constructions of happiness], Coleção Invenções Democráticas Vol. 5 (São Paulo: Autêntica, 2015), pp. 323-332. A full list of book chapters can be found here. A full list of journal articles can be found here. A fuller list of articles and interviews can be found here.